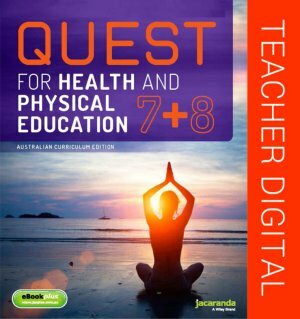 Quest for Health & Physical Education Level 5, Year 7 and 8 Australian Curriculum eGuidePLUS (Online Purchase) provides online teacher support through instant access to student and teacher texts. It also includes a complementary set of targeted digital resources with answers to all questions in the text to make teacher planning and preparation easier. These flexible and engaging ICT activities are available to you online at the JacarandaPLUS website (http://www.jacplus.com.au/). • The entire textbook in electronic format, accessible from any digital device PC/MAC/iPAD/Android Tablet. • Skillsheets, Worksheets and chapter tests designed for easy customisation and editing. • Interactive activities and a wealth of ICT resources. • Electronic tutorials for key worked examples. • Fully worked solutions to the exam practice sections.